Memories associated with substance use disorders, or substance-associated cues increase the likelihood of craving and relapse during abstinence. There is a growing consensus that manipulation of synaptic plasticity may reduce the strength of substance abuse-related memories. On the biological front, there are new insights that suggest memories associated with substance use disorder may follow unique neurobiological pathways that render them more accessible to pharmacological intervention. In parallel to this, research in neurochemistry has identified several potential candidate molecules that could influence the formation and maintenance of long-term memory. Drugs that target these molecules (blebbistatin, isradipine and zeta inhibitory peptide) have shown promise at the preclinical stage. 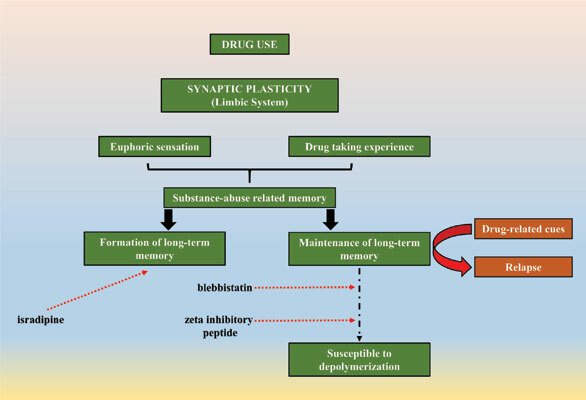 In this review, we shall provide an overview of the evolving understanding on the biochemical mechanisms involved in memory formation and expound on the premise that substance use disorder is a learning disorder. Addiction, memory, relapse, cue, blebbistatin, isradipine, PKM zeta.